I’m a huge Star Wars fan. I’m very proud of it. I’ve never tried to hide it. 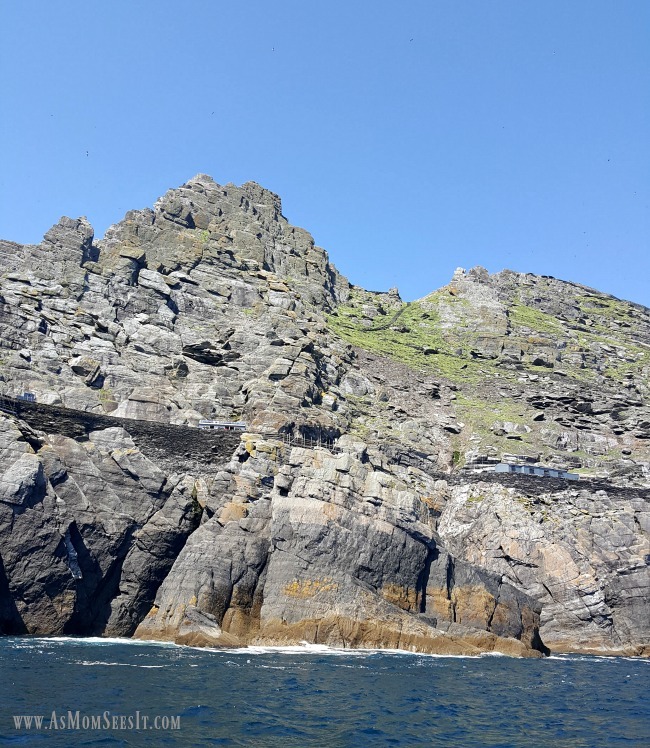 So when my husband and I were married in 2014 and discussed a delayed honeymoon to Ireland a year later, I let him know that the trip would undoubtedly include an excursion to Skellig Michael. 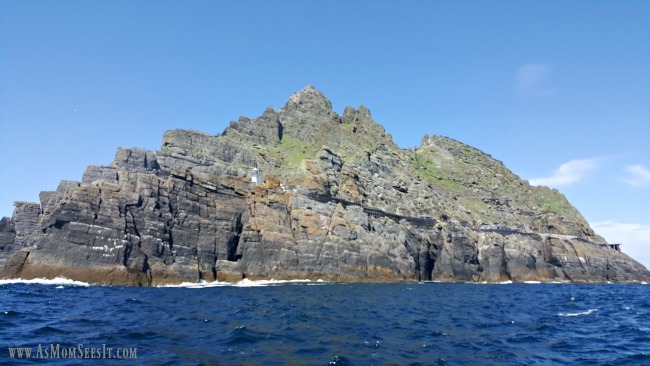 Star Wars fans might not recognize the name, but Skellig Michael, located about 7 miles west of the Iveragh Peninsula in County Kerry, was the filming location for the last scene in Star Wars: The Force Awakens and it’s the location for the first scenes in Star Wars: The Last Jedi. 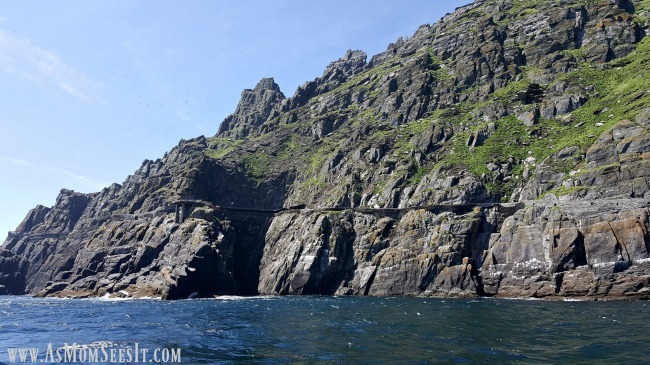 It’s where Rey climbs an ancient stone stairway to find Luke Skywalker. Yes, it is a real place, and it is stunning to see in person. In the center, you can see the living quarters for those who take care of the island. 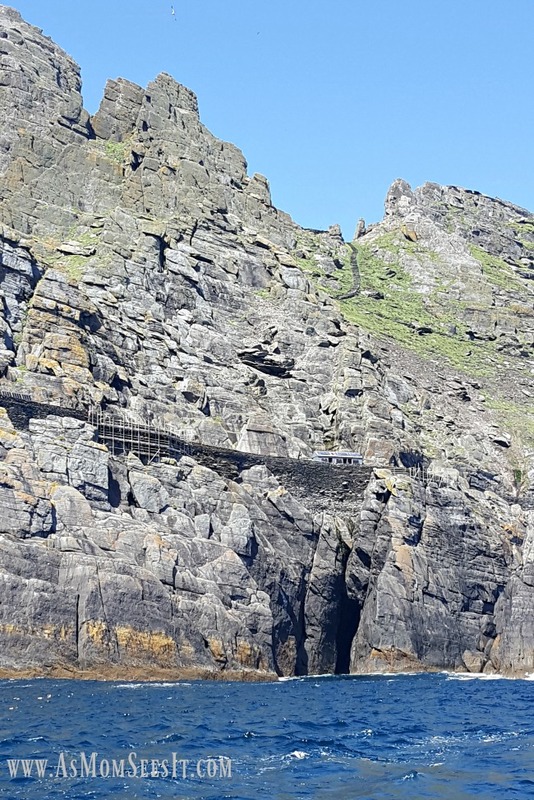 There is a monastery at the top of Skellig Michael; to get there you must climb over 600 feet (or over 618 1,000-year-old steps). People have died climbing the steps; we opted for a boat ride around the islands instead. Little Skellig pictured in the forefront with Great Skellig, or Skellig Michael, in the background. 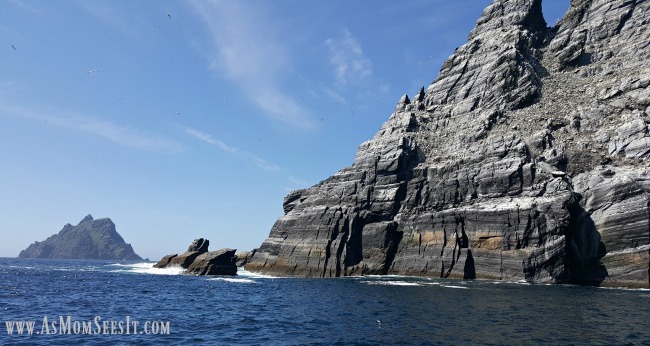 Though we only see one island in the film – the biggest of the two is Skellig Michael, or Great Skellig – there is also Little Skellig which isn’t as green and lush. In fact, it’s a bird sanctuary and it’s covered in bird feces, eggs, and nests. Just to drive by it on a boat, you can smell the island and it’s not a pleasant smell. But it’s fascinating to see, nonetheless. Within the green areas of the valley, you can see a very small path weaving throughout to the top. These are where some of the over 1,000 steps are. 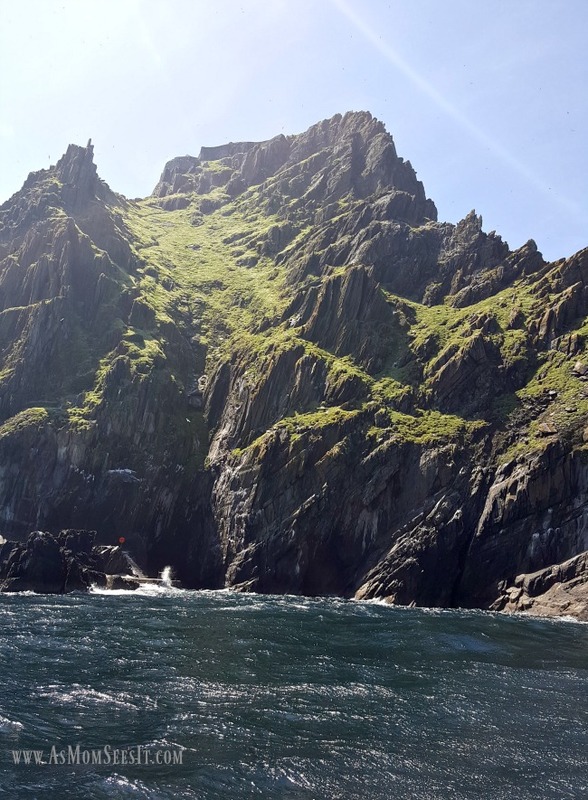 Skellig Michael will also appear in the new Star Wars film due in theaters on December 18, Star Wars: The Last Jedi. It’s the setting for Ahch-To, a planet described as mostly covered in water, with numerous rocky islands blanketed with green trees. It has served as the home of Jedi Master Luke Skywalker who went into exile seeking the first Jedi Temple after his Jedi students were killed by Kylo Ren. The Resistance was able to piece together map fragments that revealed Skywalker’s location so Rey, R2-D2 and Chewbacca traveled to Ahch-To to find him. 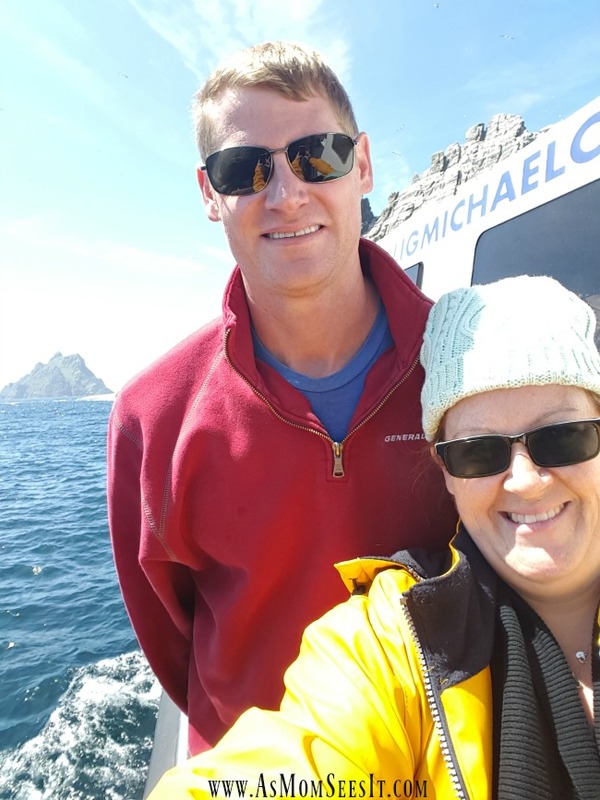 My husband and I on the 7 mile boat ride to Skellig Michael from Portmagee in South West Kerry to Skellig Michael, pictured in the background. See Skellig Michael, and the rest of the cast of Star Wars: The Last Jedi, in theaters on December 18! As Mom Sees It Is Headed To Skywalker Ranch For A #RogueOneEvent Adventure!